Kalifornia Love: Check the Mail! 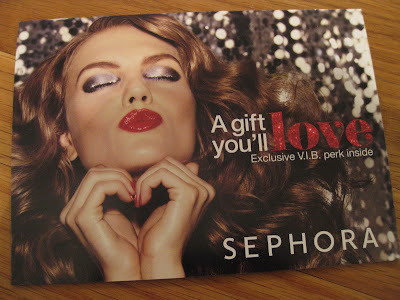 Did you get your Sephora Gift Card? do u know if this applies for canandian vib's too? or just us vibs? 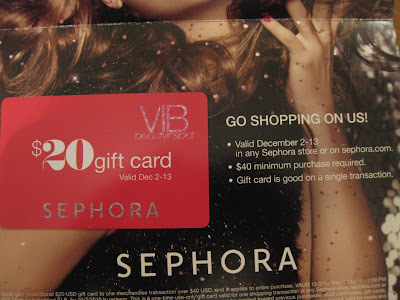 I'm not sure but Pamela (a reader) told me in a comment from my last post that Canadians did get the VIB discount recently (which I got too.) 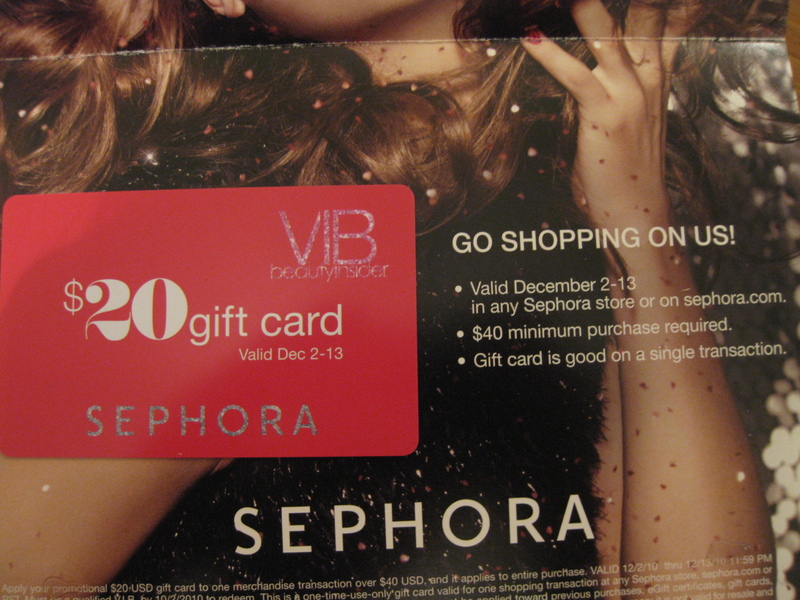 So if they got that discount, I'm thinking they SHOULD get this VIB gift card as well. I'm nowhere close to VIB but this is a really nice offer from them. Looks like Sephora is offering more discounts this year compared to last? @ Kristie.. There was a gift card for VIBs last year as well PLUS another one for regular Beauty Insiders (from what I remember) now that Tiffany brought it up. But I remember reading on the VIB page a long time ago that one of the main "perks" was that VIBs would receive a gift card during the Holidays based on how much they spent during the year so this should be a yearly thing. Oooh I never knew that they did this! This is my first year of being a VIB. I think I'll go check my mail soon :) Thanks for the heads up! I hope you get your gift card soon Amy! However, i wouldn't mind getting this card :) wow 50% off. i would maybe buy those "10 mascaras gift set." 4. Gift card for VIBs only. I got a $15 one for sure and I believe this was based on the amount you spent during the year so everyone probably got different amounts. You should get yours in the mail soon. Don't worry, it doesn't even start until Thursday. Also, I remember last year I was emailed about this stuff. Strange how I haven't gotten any emails lately from Sephora about VIB deals though -just regular mail!! Agh.. I'm so excited now! Thank you for telling me! I'm sorry, I accidentally mentioned in my comment back to Tiffany that this card would be for Beauty Insiders. What I meant to say that VIBs will be getting this gift card. If you're a VIB, you could definitely get it (but I'm not certain if Canadians will be getting it.) However, if you're not a VIB, you won't be getting it. =( Sorry!! 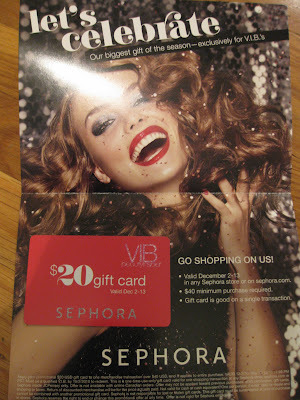 BUT maybe Sephora will send another $15 off $35 gift card to Beauty Insiders again this year -and hopefully you can get that! The card says you have to spend at least 40...but you don't. Not online, at least.